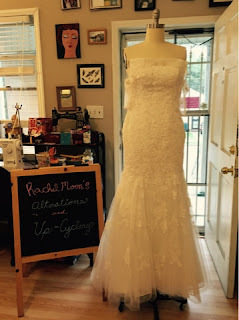 Your wedding day is a very special day and I am here to help you get down the aisle in a dress that fits like a dream. I also send you off with tips and tricks for any last minute emergencies. I do my best to offer pampering and peace of mind when you are at my shop. I have a resource for bra extenders, bra cups, dress tape, petal top pasties, lint rollers and more at prices competitive with retail. I require a deposit of $100 at first appointment, if you decide to use my services. This deposit is non-refundable and will be put toward the final cost of alterations. I do accept all major credit cards for transactions over $50. If on our first appointment you decide for any reason not to utilize my services, I do ask for a $20 appointment fee, cash only please. If you are interested in getting your measurements done so that you can shop for your gown online, I offer that service for $20. Fittings are $40/hour and billed along with hours spent on the dress. Bridal sewing and labor is $60/hour. I require a 8 week window to perform alterations on bridal gowns. The fee for bridal 7 weeks is $100 added to the price of alterations. Bridal 2 weeks or less: Unavailable (I will assist with minor last minute alterations if I am available, such as stitching on a hook and eye or sewing a belt back in place). I reserve the right to turn down any bridal alterations or custom work that I feel I haven't the time to complete in regard to my standards.